In the seventies the People's Liberation Army Air Force was not a serious rival. The new Chinese offensive machines the Q-5 Fantan and H-5 Beagle caused no problems to the Soviet fighters. Only the Chinese air force size was large. 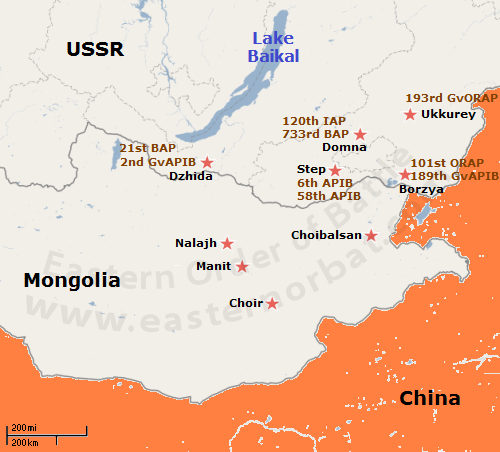 Opposite to the Soviet Transbaikal Military District’s 23rd Tactical Air Force stood the Beijing and Lanzhou Military Region's ten air divisions. 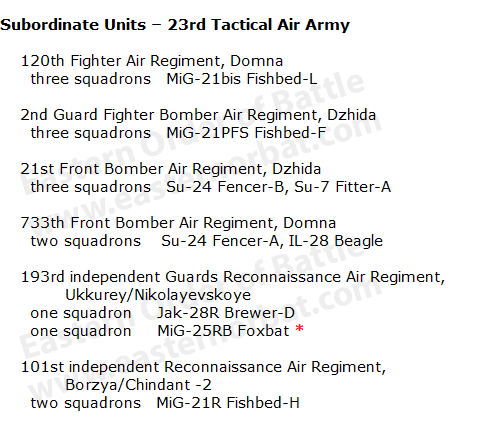 The Soviet 23rd Tactical Air Force's regiments were equipped with weapons developed against NATO in the sixties. The Russians replaced all the old MiG-17 Fresco to MiG-23B Flogger-F, MiG-27 Flogger-D, Su-17 Fitter-C, Su-17M Fitter-C fighter bombers. Two regiments were equipped with the highly advanced Su-24 Fencer tactical bomber. The reconnaissance capacity has been improved. 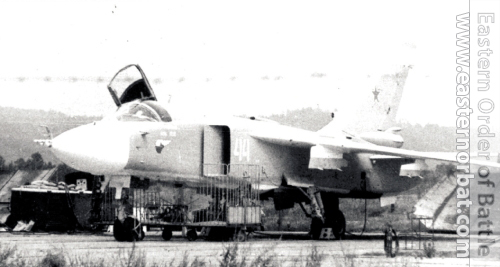 The 193th regiment received a squadron of MiG-25 Foxbat. In addition to the squadron at Borzya, they received another squadron from the Baltic Military District. The two squadrons merged. The old MiG-15bisR Fagot was withdrawn. 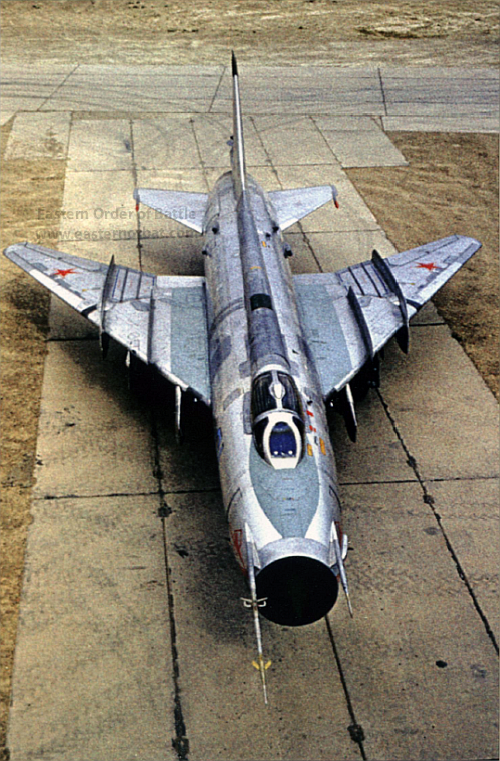 The new 101st independent Reconnaissance Air Regiment's two squadrons received MiG-21R Fishbed-H type. 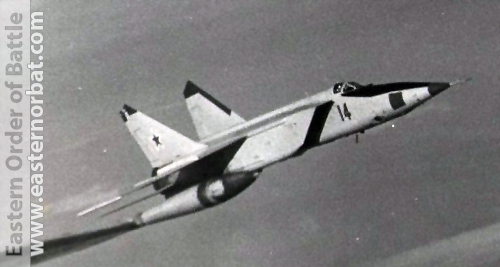 The modern Su-24 Fencer supersonic, all-weather attack aircrafts and the high-speed MiG-25 Foxbat could not been shut down by the Chinese air defenses. The soviet crews and their families were placed into better conditions. Panel housing estates were built near airports. They lived in poverty in European eyes, but it was better than living in tents. Shelters were built for airplanes at airports to protect them from Chinese attack.